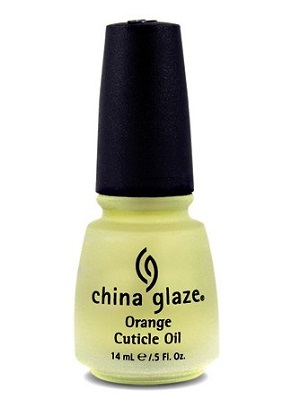 China Glaze Orange Cuticle Oil in .50 oz. size. The oil penetrates skin quickly to soften cuticles, to strengthen natural nails and to give increased flexibility. It contains a special blend of five nourishing oils, including jojoba and rice bran oils. It moisturizes with antioxidant vitamins A, C & E. It soothes skin with its botanical extracts that also act as natural soothing and antiseptic agents. It applies beautifully right over Nail Polish without dulling or damaging manicures. To use: Apply two coats to cuticles and massage in gently.